On the Telzio Dashboard, you can see a list of all the users in your organization along with their status, and call them with one click. The call is initiated through the Telzio Webphone, right through your browser! Traditionally, the user status is called presence or BLF, short for Busy Lamp Field keys, which are red lights located along the side of the desk phone. Most desk phones come with 6-8 BLF keys that you can program different extensions into, thus making it easy to see a coworker’s status and transfer calls to them. Front desk and call center operators who need more than 6-8 BLF keys require additional modules that can be purchased and attached to the phone. With the new user status indicators on the Telzio Dashboard and one-click dial capabilities via the Webphone, it’s no longer necessary to purchase extra phones and modules. Upon signing into your Dashboard, you’ll find a list of the users in your company along with their extensions (if they have one), and a dial button. Green signifies that the user is available, red means they’re on the phone, and no color means they’re offline. Simply click on the green dial button to initiate a call. You can also search for users in the search field provided. 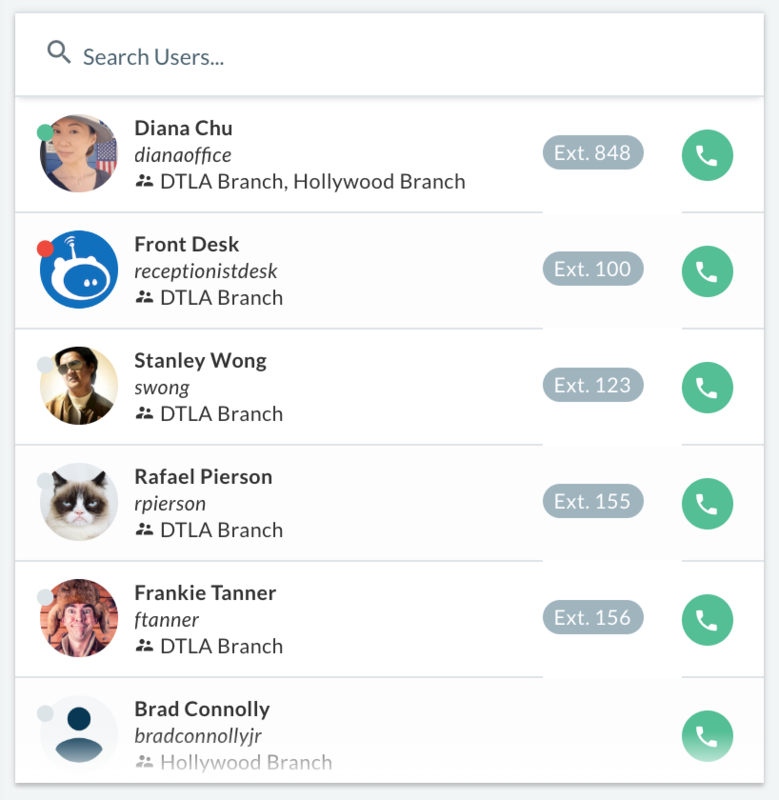 In the example below, Diana is available, the Front Desk is on a call, and the rest of the users are offline. The same can be done on the Users page of your Dashboard, plus the ability to filter by Groups and find people by department.